In the main part of anterior part of primary intestine develops gill apparatus, which consists of 5 pairs of gill pockets and gill arches. Gill pockets - a protrusion of lateral walls endoderm of the primary intestine. Gill arches - a section of mesenchyme placed between adjacent gill pockets. Primary oral cavity (mouth bay) has the form of cracks, bounded with 5 processes, derivatives of the first pair of gill arches. The upper edge of the mouth bay bounded by unpaired frontal process and by two maxillary processes, the lower edge - by two mandibular processes. Mandibular grow, processes and form the lower jaw, soft parts of the face, chin, lower lip. If mandibular processes do not grow, arises an anomaly - midpoint separation of the lower jaw, lips. Maxillary processes form the upper jaw, palate, lateral parts of the upper lip, cheeks. Frontal process is divided into medial frontal, 2 medial nasal and 2 lateral nasal. With medial nasal and medial frontal process is formed back of the nose, nasal septum, the central part of the upper lip; with lateral nasal - wings of nose. Between the medial and lateral nasal processes laid nostrils. With the growth of these processes occurs anomaly - nostril atresia (no nostrils). Lateral nasal with maxillary processes form nasal lachrymal furrow, which later turns into a nasolacrimal canal. If the furrow is not closed, occurs an anomaly - spit cleft of face. 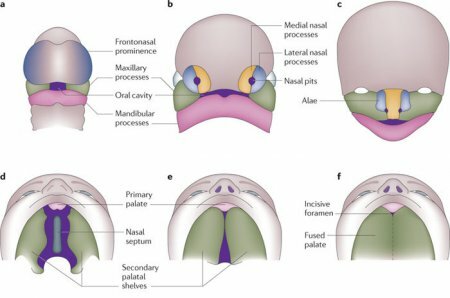 Maxillary processes with medial nasal processes grow together and form upper lip. If they do not grow, occurs an anomaly - the lateral hole of upper lip. If medial nasal processes not grow, occurs an anomaly - the medial hole of the upper lip. If occurs excessive growth of the mandibular processes with maxillary processes is formed small mouth cleft - microstoma, if inadequate growth - large oral cleft - macrostoma. Palate is formed by the growth of palatine processes (derivatives of maxillary processes). If palatine processes do not grow together, occurs an anomaly - a hole of palate. From the second pair of gill pockets develop palatine tonsils.